Patients will love these 7 1/2" x 9" full color take-home totes. 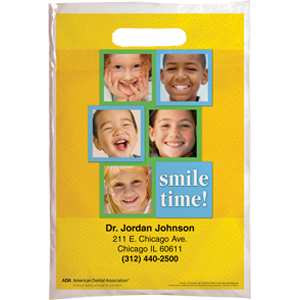 Stylish and durable plastic bags easily hold toothbrush, toothpaste, floss, patient education pamphlets and more! Minimum quantity 100. Click Add to Cart then personalize for free.